I have observed a steady increase in the number of “broadcast-LAN” tuner devices appearing in various markets around the world. These are devices that integrate a broadcast tuner which is connected to an antenna (aerial), cable-TV system or satellite dish and hardware for streaming the broadcast signals down a computer network to computers or similar devices. The computers or similar devices effectively select the stations to be received through the use of front-end software that runs on these devices. I refer to these devices as “broadcast-LAN” or “broadcast-network” devices because they bridge traditional radio or television broadcast services delivered over a traditional broadcast medium with a computer local-area network to be enjoyed on the devices connected to that network. Cheaper and, usually, first-generation implementations use one tuner circuit so are able to stream one broadcast signal down the network. But the better systems implement two or more tuner circuits and/or “split” broadcast signals that are part of a multiple-broadcast single-frequency multiplex like what is implemented with DVB-based digital TV to concurrently stream multiple broadcasts to multiple devices. Why do these devices appear on the market? Initially these devices appeared on the market to allow people to watch TV broadcasts on regular-platform computers without the need to have a tuner module in the computer and / or to have the tuner connected to an aerial, cable-TV or similar infrastructure. This exploits the concept offered by HomePlug AV and Wi-Fi technologies that the connection to the home network is more pervasive than the connection to the aerial or similar infrastructure. The classic situation that is often come across is for a TV-aerial or cable-TV socket to be installed in the main lounge area and, perhaps, the master bedroom or another lounge area but you may want to watch TV in another area using a laptop. This situation can be complicated with rented premises, buildings that use difficult construction materials and techniques or, simply, “splittered” TV-aerial infrastructure that is only optimised for TV sets that are relocated on a whim. This situation is taken further with the ubiquity of the tablet computers that are based on mobile platforms. There is a strong desire to use these computers and, in some cases, large-screen smartphones or laptop / notebook computers as a personal TV device in lieu of the traditional small-screen portable TV set. Similarly, a regular computer or NAS with the appropriate software could work as a network DVR to capture TV shows for later viewing by tuning in to signals presented by these devices. This latter situation is exploited further with mobile broadcast-LAN devices that link to mobile digital-TV services like Dyle TV in the USA. Here, the situation allows the user to tune in to a TV show on one of these services using their tablet or smartphone, but they work more as a Wi-Fi access point rather than a Wi-Fi client. 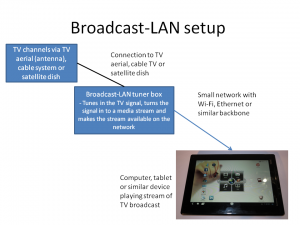 If the idea is to replace the TV-antenna or cable-TV connection to a, typically secondary, TV set with the home network, you may have to use an IPTV set-top box, a smart TV or similar video peripheral to pick up the content from the broadcast-LAN box. This situation is being made easier by HDHomeRun who have released their HDHomeRun Prime box for the US market. Here, this unit presents itself as a DLNA Media Server device and lists the channels it can provide as its content pool. 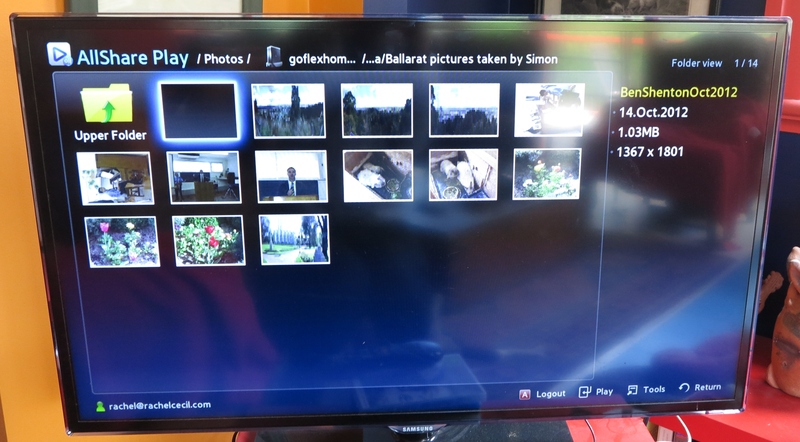 Here, you can use a PS3 or XBox 360 games console, a DLNA-capable smart TV or a DLNA-capable Blu-Ray home theatre system to tune in the broadcasts. The user experience with a broadcast-LAN setup may not be the same for what has been expected with traditional broadcast receiption. This is more so with DLNA-based setups that are focused around file-based on-demand media or client software that doesn’t offer a proper broadcast-reception experience. For example, it may take a long time to switch between channels which may make channel-surfing a bit more painful. This also can make it hard to switch between two channels which is something we may do to check on content like news or sports events that are hosted on one or both of the channels. The broadcast-LAN setups will be seen as being relevant as we continue to receive TV and radio via traditional broadcast paths and we primarily make heavy use of smartphones, tablets and ultraportable computers for our work and lifestyle computing needs. As well, there will be a likelihood of these devices working as network-wide personal video recorder devices where that capture favourite TV shows and make them available to play on demand at any device attached to the home network. They could be in the form of a high-capacity hard disk built in to or connected to the broadcast-LAN device and/or a separate network-attached-storage device holding the recordings. Similarly, the broadcast-LAN devices are being pitched in America by the consumer-electronics industry as a highly-competitive “consumers-first” alternative to the traditional cable-TV set-top box. Here, a DLNA-capable broadcast-LAN cable TV gateway can be used to distribute the pay-TV content to all the TVs in a pay-TV customer’s house without the customer paying extra to the cable-TV company to install set-top boxes on each TV. The use of RVU remote-user-interface technology which is being considered as part of the DLNA standards would allow customers to gain access to the advanced services that a pay-TV firm would offer like pay-per-view content and movies-on-demand. I see the “broadcast-LAN” devices as becoming a key device class for the home network especially where portable computing devices like tablets are being used to enjoy content that is delivered by traditional radio and TV broadcasters.